Proper mulching for trees offers five key benefits. All five will help your tree grow and thrive year round. First, mulch insulates the soil, helping to tame rapid temperature changes in summer and winter. Second, mulch helps the tree’s root system retain water and stay moist as long as possible. Third, mulch helps prevent weeds and other unwanted plants from growing too close to the tree. This eliminates competition for water and other soil nutrients. Fourth, proper mulching can help prevent soil compaction. By “cushioning” the soil, mulch helps preserve the macro-pores necessary to store air and water in the soil. Last, a mulch ring prevents lawn mower damage to the base of the tree. 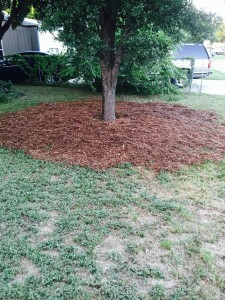 Ideally mulch rings should extend to the edge of the tree’s canopy. In newly planted trees, a mulch ring twice the size of the root ball’s greatest diameter is a good starting point. This may not always be possible, but make the ring as large as is feasible for the site and aesthetics, but always at least three feet in diameter. Carefully remove grass or sod so as to not damage any existing roots. Apply two to four inches of high quality composted mulch or wood chips. Do not let the mulch contact the trunk of the tree as this will cause problems later. Reapply mulch only as necessary. If a spring “freshen up” is desired, first try fluffing up existing mulch. If that does not suffice, reapply mulch, but stick to the depth guidelines of two to four inches and do not let the mulch contact the trunk. This may mean hauling some old mulch away! Modern arboriculture and the proper care of your trees and shrubs requires skill, knowledge, and often specialized equipment to ensure the safety of our team members as well as your home and family. We currently have two aerial lifts that are used by the production tree crew; a 58′ rear mount aerial lift truck as well as a 60′ tracked lift capable of fitting through a 36″ gate. 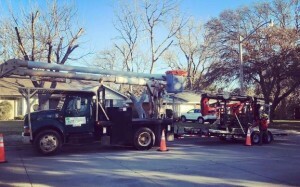 This specialized equipment allows us to safely and efficiently deal with and/or remove hazard trees or tree sections that can’t be climbed. While expensive, the cost is worth it in terms of safety and providing the best possible service to our clients. Let us know if you are concerned about a hazardous tree and we will be happy to provide you with a tree risk assessment. Newly planted trees often require staking or some other system of guying to help stabilize them until the root system can properly establish and take over. However, all too often the initial guying system is installed incorrectly and then left in place too long leading to damage ranging from cosmetic to downright fatal! Not all new planting require staking. The proper tree in the proper spot planted correctly usually is able to support itself from the get go. This is often overlooked and support is added as a matter of course without proper consideration to the overall effects or needs. Some new plantings do require supplementary support for a short time. Properly installed tree supports should be taunt enough to stabilize the tree and prevent it from tipping. 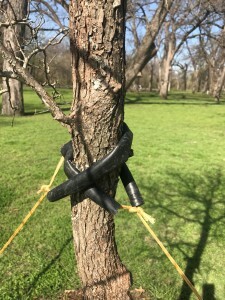 There should be no tight, cinching connections around the trunk or branches. The staking or guying system often need to be adjusted multiple times and should always be adjusted to suit the tree’s needs and the environment. Eventually your new, healthy tree will be able to stand on its own and the staking and guys should be removed entirely. If a tree is still unstable and/or tipping a year after planting, be sure to consult our ISA certified arborists on the best plan of action. There may be extenuating health, site or environmental concerns to address. It is time to prune your oaks! Starting July 1st through Jan 31st Integrity Tree Care will be happy to care for your red and live oaks to promote health, beauty, and vigor. This is the time frame recommended by the Texas Forestry Service and ISA Texas for red oaks and live oaks. Most of the other common oak species in the area are more tolerant of oak wilt and pruning is possible year round. For maximum health of your oak trees, we may still recommend holding off on some red and live oaks pruning till January. If a red oak requires a lot of live foliage removed, this is best done late in the year to avoid sun scalding, for instance. 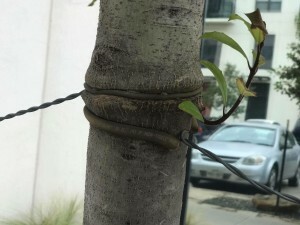 Regardless of the reasons or time of year, proper pruning techniques should be used. These techniques include making proper pruning cuts and avoiding injurious practices such as topping or excessive crown thinning. It is with great joy and a sense of accomplishment that can only come from persistence that Integrity Tree Care is pleased to announce that Jimmy Prichard has achieved a long time goal. 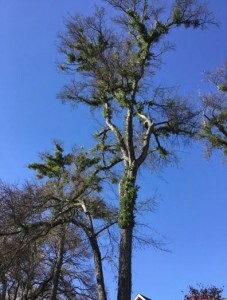 After for 14 years of participation, 10 Masters’ Challenges and at 45 years of age Jimmy owns the title of Texas Tree Climbing Competition (TTCC) Champion! The TTCC is an annual event where climbers from across the state gather for fun, friendship and to compete in a series of five preliminary events leading to a final Masters’ Challenge to determine the overall winner. The events are modeled after real world production tree climbing activities and test the climbers’ ability to access climbs and work in trees safety and efficiently. Winning is no small task. Everybody here at Integrity Tree Care is extremely happy for Jimmy’s accomplishment. 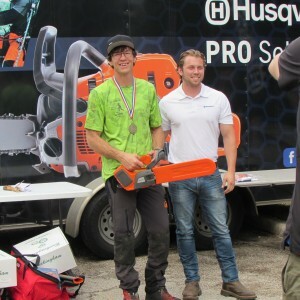 We look forward to cheering him on in late summer 2018 in Columbus, OH where the International Tree Climbing Championship will be held to crown the best tree climber in the world! There are a wide variety of tree health care issues that arborists deal with above ground. However, it’s easy to forget that there is just as much plant material below ground as is above ground. And that underground portion (the roots) is just as important (maybe even more important) when it comes to overall tree health. The difficult part though, is that we can’t easily see what might be going on that could be affecting tree health. There are many root system issues that need attention in tree care. More often they relate to soil based issues, but a big one is Stem Girdling Roots (SGR). Stem Girdling Roots refers to a common problem with urban trees where the roots up near the stem of the tree grow in circles under the soil and over time will girdle or ‘choke off’ of and eventually kill the tree. 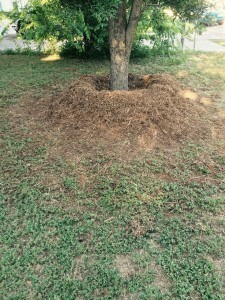 It often happens with trees that have been planted too deep, with mulch piled up too high around the trunk, or trees that were in pots too long before they were planted. Knowing whether you may have SGR or not will take the skill of an experienced arborist by doing a process known as root collar excavation. The process involved using a pneumatic tool (Air Spade) to remove the soil from around the tree and roots to expose the roots without damaging them with mechanical tools. In other words, we use highly compressed air to blow away the dirt. This allows the arborist to see if there is a problem with the roots and determine if pruning is needed. The Air Spade is also very useful in decompacting and aerating the soil within the tree’s critical root zone. Canopy symptoms of SGR will typically present with the very top center part of the canopy dying back or thinning. Certain trees will also start presenting early fall color in those top center portions of the tree. Other indications can be dead spot on the side of the lower trunk with a lack of a clear flare to the base of a tree. The lack of a flare at the base of a tree (root flare/pedestal flare) is not necessarily an indication of SGR, but it does often indicate a tree that has been planted too deep which can lead to tree health issues on its own. If left undiagnosed or untreated, SGR’s will eventually kill the tree. In my experience with trees expressing symptoms of SGR, about half the time the damage from the girdling roots is too far progressed to fix. Therefore, I recommend that you have all your trees evaluated by a Certified and qualified arborist in plant health care to notice any signs of SGR before the problem is uncorrectable. You can avoid SGR by; carefully and properly planting new trees making sure they are not too deep in the ground, mulch the areas around the base of trees with a level 2-4 inches of mulch and avoid piling the mulch up next to the trunk, and refuse trees that have been in pots more than a year or that already have circling roots in the pot or root ball. Caring for trees and the soil around them is an often overlooked but important part of tree healthcare. As I stated earlier, we can use the Air Spade to aerate the soil around your tree. So often time the service can be used to investigate potential root system problems while providing a huge benefit to trees by improving the soil conditions that they are growing in. If you have a tree that seems to be declining, contact a qualified plant health care arborist and make sure a thorough evaluation is done to the root systems and well as the canopy in order to properly diagnose the issue. Fertilization, at its root, is about making the growing conditions for your trees as productive and healthy as possible. The urban environment in which many trees grow can be deficient in the essential nutrients needed for growth and sustainability. Often these nutrients are used by lawns before the tree can process them. Fertilization adds back to the soil that which is naturally depleted throughout the course of growth or absent due to site concerns or restrictions. Essential minerals and other compounds, derived from animal and plant matter, form the basis of our fertilizer. Added to soil in prescribed amounts, it provides nourishment and sustainable energy to enhance health and vigor now and for many tomorrows to come. It is important to remember that tree fertilization is not a cure-all. Soil samples should be taken, drainage assessed, and non-sustainable, unstable growth that only looks good in the short term, but does nothing for longevity should be identified and corrected. By using natural compounds, Integrity Tree Care tries to avoid the leaching issues and toxic build ups that can be associated with some fertilizers. By working with nature, supplementing the materials nature would provide in an ideal situation, your trees and shrubs can be kept vibrant, healthy and looking good for years. Depending on fertilizer types there may be beneficial ingredients that are non-organic. In a forest environment most mature trees have the best soil conditions and leaf litter cover in the forest floor to keep the trees from needing additional watering in the hot, dry summer months. But our backyards are nothing like forest situations. Furthermore, there are some areas of the country where trees are traditionally not native or common (mid-west Great Plains). Therefore, if you want your trees to reach their full potential and be and stay as healthy as they can be, watering them is the single best and easiest thing you can do in that regard. Here are 4 main points to consider and follow when watering a tree for the best outcome. The trick to watering a tree is to provide a lot of water, but over a long period of time. Use a soaker hose on a very slow trickle or tree watering bag (Tree Gator, etc.) to give a large amount of water over a 8-10 hour period. You want to soil to be at what is called ‘field capacity’ as much as possible. The slower the better! Grandma always told me that knowing when to water was the easiest part of gardening. Just stick your finger in the dirt; if it’s dry, water, if it’s wet, don’t water. One of the most common problems I find with people who do water their trees trying to do the best is that they end up over-watering. Often time in urban areas the soil is compacted or mostly clay like soils. Those soils hold more water and drain slower than quality forest-like soils. So you’ll need to water even slower and less frequently than most recommendation schedules. If your soil is sandy and never puddles, then you’ll need to water more frequently. Some species of trees will give you a little notice that they are starting to get dry. Birch, locust, buckeye, and some others will start dropping yellow leaves from the inside parts of the canopy when the weather gets hot and they are getting short on water. But most others will not, and if you wait until the tree starts showing signs of drought stress, you are way too late to keep the tree from severe stress. Pay attention to weather patterns and water before the trees start showing they need water. In most areas of the country, for established trees, a watering once or twice a month in July and August will go along ways to keeping your trees healthy. Watering new or young trees needs to be a different schedule. You still want to be careful not to over-water, but having a fairly regular schedule all throughout the growing season will ensure the roots have enough water to grow and establish from the stressful transplanting process. Watering your tree can be easily overthought and can seem intimidating, but the main thing to consider is that as long a s the soil is moist, the tree should be happy. Have a plan to water your mature trees when the weather turns dry. Water very slowly over long periods of time. And be aware of how your soil drains so you don’t over-water and drown your tree. Follow these few steps and your tree will be on its way to thriving versus surviving in your landscape.